The smaller size is ideal for travel, but this spa quality sponge is also nice for periodic pampering. 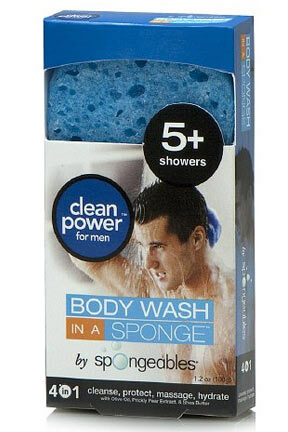 Clever technology combines body wash as the sponge is manufactured, so using one is easy and convenient. This one provides at least five uses before it runs out of lather, and comes in a smaller size that is perfect for a business travel, a camping trip, backpacking, visiting relatives and more. It is convenient because you only have to grab a single compact item instead of two, and it simplifies air travel because you don't have to worry about silly restrictions like you would when carrying a full bottle of body wash. Superior ingredients clean amazingly well and leave your skin feeling great, and the pleasant scent is not overpowering. Simply get wet to see it in action, the stiff bar-like sponge will soften and produce suds that allow you to wash like normal. The 4-in-1 experience will enable you to clean, protect, massage and hydrate your skin in one easy step. Looking for a larger one for everyday use? Want to spend less money for each use? The 20+ Size is the same only bigger, so get it instead if you don't need the convenience that this smaller travel size provides. High quality ingredients like olive oil and Shea Butter combine to clean and moisturize your skin while prickly pear extract helps to soften, condition and slow the effects of aging. Added nutrients like vitamin A & E keep cells healthy and provide fortification against environmental stresses. Add to that the gentle exfoliation and massaging action that the sponge itself provides, and you have one of the best ways to care for your skin. This clever product combines soap and a sponge into one effective tool that cleans well, provides anti-oxidant protection for your whole body, and thoroughly hydrates to prevent dry skin or irritation. The patented technology combines a foam release system with aromatherapy in order to give you a powerful product to clean and pamper your skin. The mild scent is definitely manly, but not overwhelming, and the sensation it offers is both energizing and refreshing. Use one at home for everyday cleaning, or get one for travel to reduce bulk, and simplify your list of items. Even when the built in soap is gone, the sponge remains useful for more time when other soap or body wash is added. To use, remove from package and take of plastic covering. Get wet with warm water. Allow to fully saturate. Once dampened, squeeze sponge to produce cleaning lather. Once bubbles form, wash like normal. The slightly stiffer sponge will gently scrub and massage your skin. This version is rated for five or more washes. Exact length of use will vary slightly depending upon conditions. After showering, simply rinse a bit and squeeze out excess water. Place anywhere to dry for later use. # Uses 5 or more. 4-in-1 Yes. Clean, protect, massage and hydrate with this one product. The perfect travel companion. Pamper your skin and outwit the TSA at the same time. No liquid means no restrictions when traveling. This lightweight and compact sponge and soap combo is great for once in a while pampering, but also ideal for any travel situation due to the compact convenience it offers. Order Yours Today! I discovered these when I received a gift basket containing one and I have been hooked since, only drawback is they are sometimes difficult to find. Exfoliate, Clean & Moisturize In One Step. Spa Quality Sponge Infused With Premium Soap.